Deacom, Inc., an Enterprise Resource Planning (ERP) provider for manufacturers and distributors, has officially launched its DEACOM DISCOVER website and opened registration for all customers. This year, the annual user conference will be held at Hilton Philadelphia Penn’s Landing from April 2-4, 2019. Each year, the event exceeds expectations as DEACOM veterans and newcomers take advantage of the unique opportunity to collaborate on strategies and learn how to best apply DEACOM ERP’s capabilities to drive business success. Shorter, Detailed Sessions – Deacom is now offering 90-minute sessions that will dive deep into more specific topics. By providing a wider, more detailed range of topics to choose from, attendees will gain more value from their entire experience. Topic-Focused TechLabs – Every TechLab will have a specific focus and be offered during each of the session timeslots. No matter your interest, be it Accounting, Warehousing, Reporting, or Production, there is a designated TechLab session where Deacom experts will help you navigate critical business scenarios within the DEACOM environment. A Taste of Philadelphia – Take in the beautiful Philly skyline while sailing down the Delaware River for a chartered dinner river cruise. Conference attendees, along with Deacom team members, will come together for a can’t-miss tour of the city while expanding their network and growing relationships within the DEACOM user community. 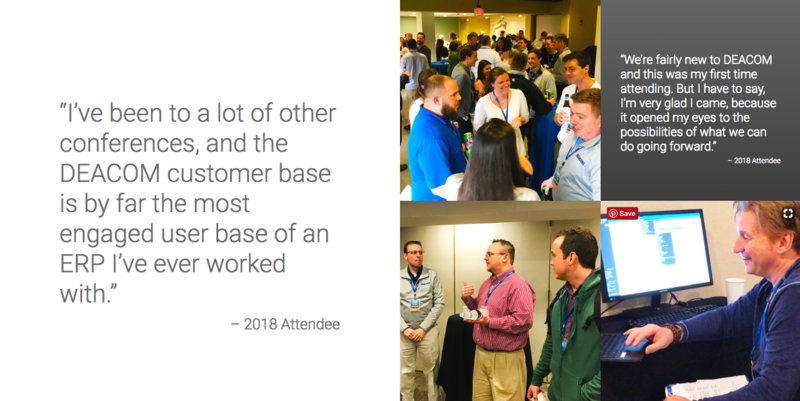 Deacom customers can register now for DEACOM DISCOVER 2019 and save with Early Bird pricing. For more information about Deacom, visit www.deacom.com or call 1-877-4-DEACOM.